You have to understand that asking for forgiveness is not a “sybaritic” approach, which means it is not an easy process… It is hard and I can surely attest to that. If you want to find the best way to ask for forgiveness after cheating, what is important is to remember is that you have to find out some good ways to regain the trust of your spouse and do it slowly: not in a rush. The first step is to come to terms with yourself as to why this trust was lost and hold yourself accountable for what you have done. Never lose focus of the fact that you are accepting the wrong you have committed and you are willing to do whatever it takes to . Infidelity in marriage is not an easy thing to deal with but as I showed you on behalf of Dr. Huizenga most couples do not end their relationship after incident of an affair and with the right professional guidance are able to forgive one another. A heartfelt and sincere apology is usually critical. Family experts who give relationship advice often suggest that when cheating occurs in a relationship, the person who has committed it should take the responsibility of being a cheater that has put their relationship at risk. Try to avoid using lame lines such as “it just happened” or “that was not my fault”. Instead accept your fault! 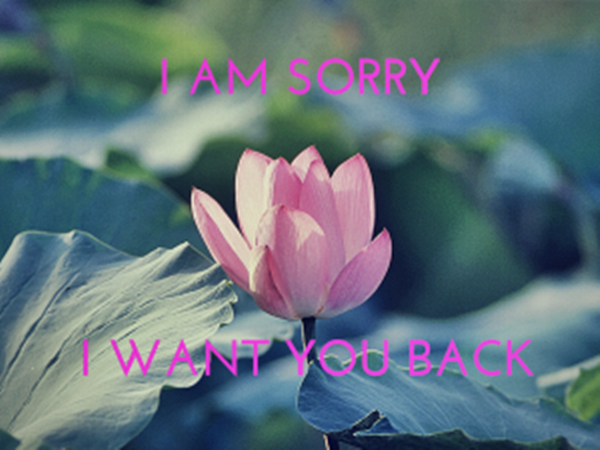 You can write apologies or speak to your partner over the phone. Face to face conversation is also good, if can bring yourself do it properly. If you usually let too much emotions come out of you as opposed to reason then it maybe best to write an email or a note to your spouse. You have offended him or her so choose the meeting venue accordingly. Try different methods to apologize, but keep in mind that if your partner is not ready to receive your apology, then you should pace for a while. Do not sound desperate or risk the situation. Not everyone can accept an apology so quickly; your words will vibrate in her or his mind. So allow the seed to grow. Ok so you have cheated on our spouse an know you really feel bad about it but want to get back together and make up. You have promised yourself and her that it was nothing serious and you will not do it ever again. If you seriously want to find out how to ask for forgiveness after cheating try to understand how they feel as well. Usually when we become desperate we ignore the other person’s feelings, so again depending on your situation try to really understand how a man feels after being cheated on or how a woman feels after being cheated on. Asking for forgiveness in a marriage is not always an easy task especially if it’s in regards to infidelity and cheating on their person as it depends on several factors. The more your partner loves you, the more she or he gets hurt due to the infidelity. So, if you are thinking about finding answer to how to make up after infidelity, think about the positive aspects of your relationship, and give it time. This is what we routinely see Hollywood movies where men who cheat are prone to cheat. However, in real life is completely different; men or women who cheat and come forward to ask for forgiveness are less likely to cheat again. If this is you then have to promise your partner that you will change yourself, and you will make sure that you will never do this again. You are willing to do whatever it takes to prove this to him or her. Forgiveness can’t be forced or rushed, so have patience and make sure you do not make mistakes in offering your apology that would make it worse. You must know how your partner feels at the moment, which means you have to work with their feelings to regain the trust. You are reading this because you really love your partner and want an apology as you are searching for ways on how to ask for forgiveness after cheating so do whatever possible to get your spouse back and make your love even stronger for each other.